Join us for an evening with poet, fiction writer, translator and activist Meena Kandasamy discussing her acclaimed second novel When I Hit You. Informed and inspired by her own experiences, Kandasamy’s second novel is a dazzling and provocative novel of an abusive marriage. Caught in the hook of love, a young woman marries a dashing university professor. She moves to a rain-washed coastal town to be with him, but behind closed doors discovers that her perfect husband is a perfect monster. 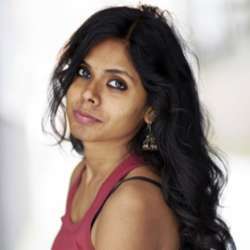 Meena Kandasamy is a poet, fiction writer, translator and activist, now based in London. She has published two collections of poetry and the novel, The Gypsy Goddess Protected content .